Everyday Education publishes books and articles designed to help you homeschool through high school and beyond. The website began early in 2001 after I (Janice Campbell) wrote Transcripts Made Easy. I needed an assignment to challenge one of my computer-oriented sons, so I asked him to create a webpage where I could post articles and sell my book. He jumped right in and created Everyday Education, the homeschooling site we have built upon and used ever since. You can see a screenshot of what it looked like so many years ago at the bottom of this page. My biggest project so far has been the Excellence in Literature curriculum for grades 8-12. Having the site available encouraged me to write more and to think seriously about what I wanted to do with this fledgling business. Over time, I understood that my purpose was to encourage and equip homeschooling moms for this challenging and joyous journey. 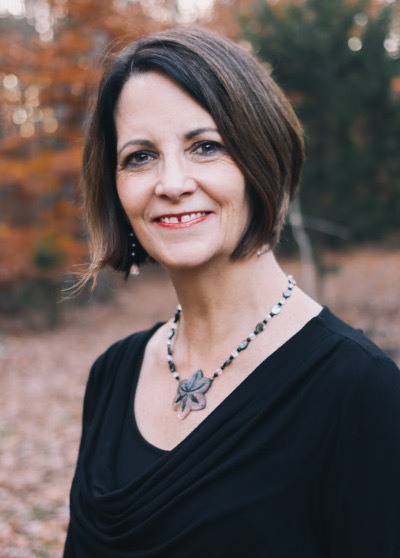 Most of my writing has centered around homeschooling, cultivating creativity and virtue in an ordinary life, reading, writing, great literature, and entrepreneurship, and those things, along with soul care, will continue to be central to what we do. In 2005, Everyday Education became a sole proprietorship, and in 2008, it became “Everyday Education, LLC,” a limited liability company. We remain small and family-owned and operated, so if you contact us, you are likely to hear from me or my husband, Donald. We have chosen to remain small so that we can remain in touch with readers. We hope that you will enjoy doing business with us. We are located on the east coast of the United States, so the time zone is EDT or EST, which is GMT -5:00. If you email us outside of business hours, we will do our best to return your email within 24 hours, usually in the afternoon of the first business day after you write. Please feel free to email again if you think we’ve missed your note—we get hundreds of emails each week, and while most arrives when and where it should, something occasionally goes astray. We ship all retail packages via United States Postal Service Priority Mail—it has proven to be speedy and reliable, and relatively cost-effective. My goal is to ship all packages within two business days of receipt of the order (weather and post office access permitting—this may vary slightly in the winter). Wholesale packages are shipped in the most cost-effective way we can find. Thank you for ordering! We are working on finding ways of making our books more easily available overseas, as shipping is quite expensive for international packages. I haven’t quite figured out how to calculate international shipping in our software, so if you would like to order, you may email us for a shipping estimate based on the weight of your package. We ship in the most cost-effective way we can find and charge actual shipping, with no additional handling charge. Some of our books are available through Book Depository, and we will add other sources as we find them. If you purchase a book from Everyday Education, and you feel it does not meet your needs, you may return it within 30 days, in original condition, for a full refund of the purchase price (not including shipping). Please email us at the email address listed above for a street address to ship it back to. The post office box doesn’t work for book returns—they squish it, fold it, and make it look as if it’s been through a war zone. It’s definitely not resellable after that! In the spirit of “making time for things that matter,” I do not spend much time on the phone. I prefer to be whole-heartedly with my family while they are at home (and someone is always at home), so other conversations happen in person or via e-mail or snail-mail whenever possible. Thank you for understanding! If you urgently need to reach us and only the phone will do, the number is 804-767-5961. The best time to call would be Monday-Thursday from 1 p.m.. to 5 p.m. (I write in the morning, so don’t have the phone on until after lunch). I encourage you to please try email first, as many queries need a response with an email attachment, and those are more likely to reach your inbox if they are a reply to an email from you. We process all our payments through PayPal, Amazon, Clickbank, and Square, and the company name on your billing statement should be Everyday Education, LLC, or some abbreviation of it, depending on the payment processor. 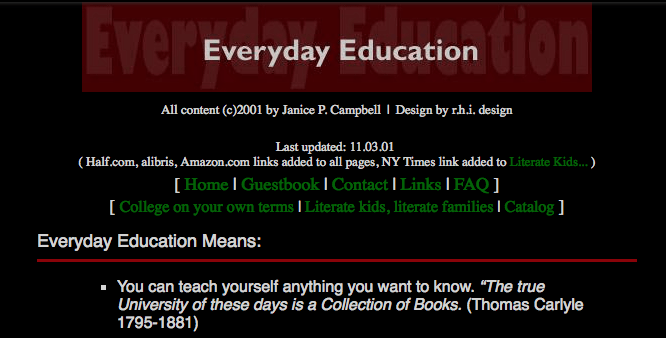 This is Everyday Education’s very first website.